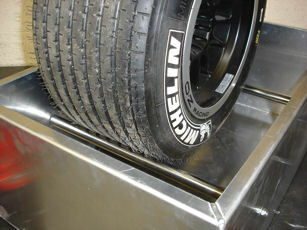 Pit Equipment can be made to suit your specific needs! 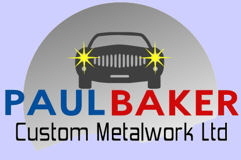 Phone or email with any enquiries. 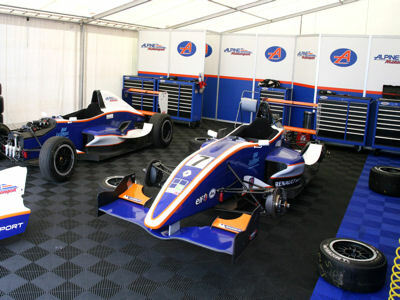 The Pit Equipment shown has been made to specifications supplied by Alpine Motor-sports who have tested it for two successful race seasons. These trolleys are made from aluminium for low weight & simply slot together for making it easy for transportation & storage. They can be made to your specific needs at a small extra cost but this standard one holds 12 formula wheels and has locking wheels and a folding hitch for towing on quads or golf carts. 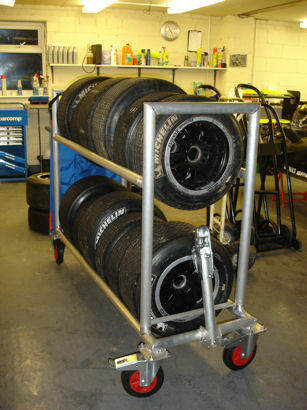 Wheel wash tank including lightweight wheeled trolley with brakes and valve! Rotate the partially submersed wheel on rollers to enable quicker & easier cleaning of race wheels! Wheel wash tank without the trolley or tap. Aluminium outer casing fitted with 10 x 50 watt downlighters, 2 double sockets and 2 airline outlets! Can be powder coated to suit team colours! Quick lift jacks for the front & rear of the car. These can be made to suit your sizes, maybe you require a higher or possibly an easier lift! Direct replacement for the formula Renault standard plastic one which is easily broken!